Early start to catch Mass at the St. Joseph chapel inside St. Peters Basilica. There are 44 chapels in this largest church in the world. We were right next to the Peter’s Crucifixion chapel — the exact geographical location where Peter was crucified upside down in Nero’s Circus. And GUESS what the readings were? John 21 where Jesus informs Peter that he will die by crucifixion! 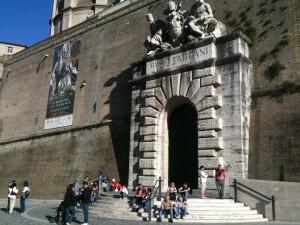 The whole group took a tour of the Vatican Museum and then St. Peters. Not much in the way of pictures or videos of that but lots of everything else. After the tours we went the Regina Apostolorum University of the Legionaries to tour the Holy Shroud of Turin display with the life-sized bronze of Jesus in the tomb, the 3-D hologram of the Shroud and then free time before dinner. Enjoy!